Well, if the shoe fits, I guess I’ll wear it. But… I don’t come about it lightly. To me, stuff has to make sense. One thing I abhor is mindless ranting that is specifically intended to scare people. What is even worse is when sound science and research is twisted to fit this purpose. Usually you see this as “Argumentum ab auctoritate.” One of the more popular tactics is to roll out someone carrying credentials and point at them as justification for the fear mongering because something they have said supports your alarmist claim… even if it doesn’t. Recently commenter Robin Hull Pointed out a fresh new article by Independent.co.uk titled “Risk of supervolcano eruption big enough to ‘affect the world’ far greater than thought, say scientists.” Yeah, like we haven’t heard that before. (yawn). Before I continue, many thanks to Robin for bringing it up. At the time I was freaking out by the actions of my dogs and needed the distraction so that I could get my mind off of what it was they were alerting on. (I had already checked the yard). Reading the article, this is what I found. “The eruption of a “supervolcano” hundreds of times more powerful than conventional volcanoes” Really? Okay, lets go with that. The last eruption was 600,000 years ago. In that time, Yellowstone has accumulated “10 to 30% partial melt.” (ignoring the numerous caldera filling resurgent activity eruptions, so that adds a quite bit of uncertainty). 30% in 600kyr yields about 1% additional melt for every 20,000 years. In order to get to the 50% melt accumulation where the authors believe that the pressures would be high enough to be in danger of erupting, we need another 20%. At the 20kyr per 1% rate, that’s an additional 400,000 years. If you assume that the 10% current melt is correct, you get 60,000 years for a 1% increase. To get to 50%, you need another 2,400,000 years. Hmm…. One of the more common statements is that Yellowstone is “overdue” since the spacing on the last three or so eruptions is about 600,000 years. One thing I have found is that volcanoes don’t play the stats game very well at all. If your prognostication uses only 3 events, your stats are worth crap. Taking the eruption dates from a larger history of the hotspot reveals that the average interval is actually about 500,000 years. Worse eh? Not so. That list includes many caldera filling eruptions. The only criteria is that it made a tuff deposit somewhere. Since it is composed of 31 data points it is a bit more robust. The one sigma (standard deviation) is 648,588 years. The 95% confidence interval is 271,684 to 728,316 years. If you want to be more realistic, and only use honkingly huge events, the average gets closer to 5.4 million years or so, but that is from looking at it a few months ago and is from memory. Caveat: I am not a geologist, nor am I a statistician. My stats experience is from failure analysis and process control of electronic equipment. If you think you can do a better job, by all means, please do. Even if your numbers are different than mine, at least you are using your own mind and looking at the data for yourself. Fair warning, not only do volcanoes not care about the Gaussian distribution, they don’t care much for Poisson distributions either. Hekla and Katla showed me that. In keeping with the apparent tradition of articles about the Yellowstone Supervolcano… the obligatory picture of Grand Prismatic Spring. Pretty isn’t it? I think that’s the reason most of them use it. This is not the yellowstone caldera. This pool is about 26 meters by 96 meters. The actual Caldera of Yellowstone is several orders of magnitude larger. In my opinion, this spring/pool formed from a maar like explosion. It’s also what I expect to occur again at Yellowstone should activity actually begin creeping upwards. About 160,000 years ago, a maar like detonation formed West Thumb. Yet one more event in the many that filled in the ancient collapse caldera. Magma + Water below the supercritical pressure = boom. Supervolcano eruption mystery solved James Morgan BBC News. Risk of supervolcano eruption big enough to ‘affect the world’ far greater than thought, say scientists Steve Connor The Independent. This is still as true as it was several years ago. 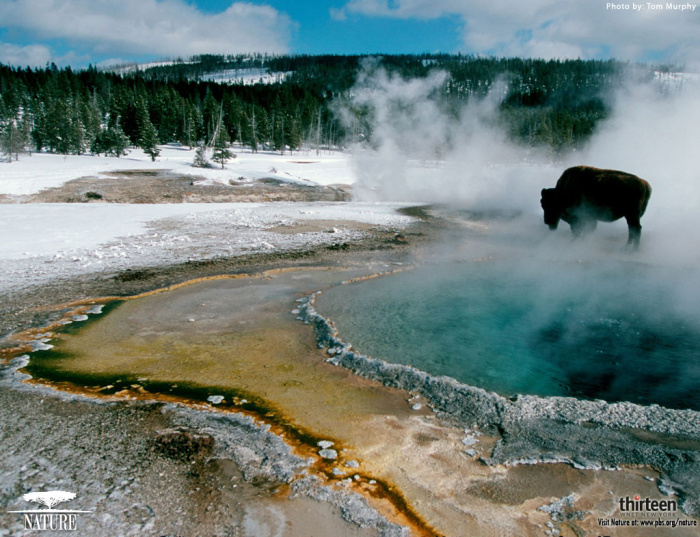 The story that Yellowstone could build up to an eruption fast still runs today. And it is still used every year as the volcano that sells papers threatens a super eruption. But it threatens nothing of the sort. In fact, the chances are that it will never have another major eruption. The hot spot moves on, and at some time will make an attempt further east. Or perhaps, as we don’t really understand where the hot spot came from, we don’t understand how it will end either. Perhaps it will just peter out. No, the real dangers are elsewhere. We have had a VEI7 about once every 300 years. But they don’t happen to schedule, and the risk doesn’t depend on when the last one was. We can say that there is a 0.3% chance of a VEI7 each year. But even though we haven’t had one for 200 years, the chance remains 0.3% per year. That is high enough that risk analysis should take it into account, but without panic. VEI6’s are more common and there is a 1-2% chance of one during the next year. Bigger than an ordinary VEI7? A Toba-like eruption, perhaps once very 100,000 years – 0.001% per year. A flood basalt eruption? Once every 10 million years – 100 times less likely. And finally, a movie of all USGS recorded earthquakes since 2000. 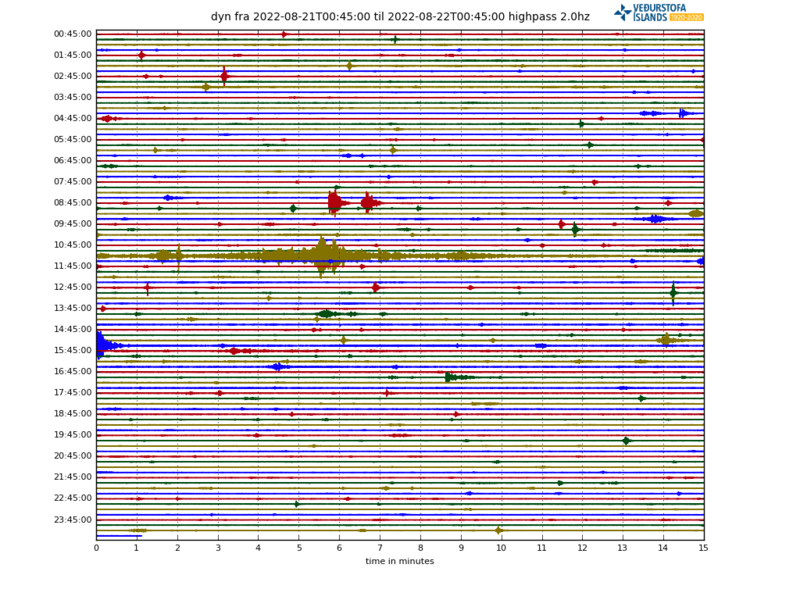 Spot the Bardarbunga eruption, when Iceland flickers. DailyMail are reporting that Apocalyptic super-eruptions at Yellowstone volcano 630,000 years ago plunged Earth into TWO volcanic winters 170 years apart. The two eruptions have been confirmed by a US Geologist. Is there an “anomaly”, isn’it? Well, that stands to reason. Holuhraun was initiated by changes in the regional stress field. When the extensional stress got to the right level, the dike started propagating. Is there still a working GPS in the area? This should have caused a notable movement up or down. It keeps following the pattern of alternating events in the south and the north of the caldera. They never coincide. This suggests it is the ring fault that is moving. I think this is a case of what goes down must go up. There is still a continuing pattern of balancing the north and south quakes which suggests the plug is slowly rising back to where it started. I would imagine it will take a great deal of energy and time to move it back into place. I wonder if you could calculate the energy released when it dropped and compare it to the average rate of energy now pushing it back up and calculate when it would get back to even. Would be great to have that GPS in the middle of the caldera back to confirm it is moving upwards. Anyone else having issues posting, I keep getting Invalid Security Token error? I think you have it right to a point, that said the ring fault rock has been taking a geologic proverbial clubbing so i would predict that as its integrity becomes more splintered over time then will take less overall built up pressure required for the next volcanic episode to kick off from the system. I really don’t think it needs to push it all the way back up in order to erupt. However, I do think an eruption on the ring fault is unlikely. I base thinking this on the fact there was no eruption on the fault in 2014 and there appears to be better escape routes (example – Holuhraun and Gjalp) out from under the caldera other than the 10km up the sides of the ring fault. Surely it’s a pliston ! It stops up the hole , and the effect of the weight must be a factor in driving any molten material down the path of least resistance? A little like the famous gasometer overlooking a certain London cricket ground. I would love to know what is being said here. Can anyone translate (or summarise) at all? Great video shots from relatively close up that I haven’t seen before. Despite the last 5 days, the intensity of the earthquake decreased dramatically, the status of Mount Agung is still alert level 4. In fact, now often occurs non-harmonic tremors, as well as sulfatara smoke that is thicker until it reaches 400 meters above sea level. Wednesday (25/10) morning, still seen sulfatara smoke out of the crater of Mount Agung. White smoke grew thicker with non-harmonic tremor reached 2 times, for 24 hours on Tuesday (25/10) yesterday. Until now the intensity of earthquake reached 271 times, which consists of volcanic earthquake in 133 times, shallow volcanic earthquake 131 times, and local quakes 7 times. 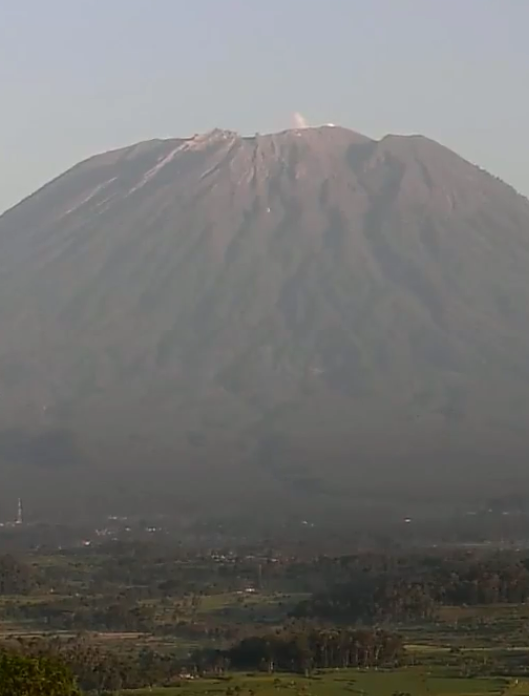 The Center for Volcanology and Geological Hazard Mitigation will evaluate the status of Gunung Agung by seeing seismicity on Thursday (26/10). When I looked in the morning, there was no “steam”. A lot of the time it wasn’t visible. At others there appeared to be no steam, but when seen from a different cam it was there, but being blown flat. Then again, there were both times when there was none, and times when there was a vigorous, quite tall plume… As tall as I’ve seen for a few days. I also think the air quality today was not good. It was rather murky. Overall, there was less steam, but it was very much “pulsing”. Ok, here’s something I was wondering, based on what I saw.In general there was less steam. But when it was there, it seemed to be emitting with some force. I was wondering … At times they seemed to be wisps of steam, but not moving at all lazily. Moving upwards as if carried in a stream of some other gas… Something less visible. Do we know what’s happening with the mountain’s SO2 emmissions? Are they declining with the seismicity ? or increasing? Neil, a lot of the time I think the reason steam wasn’t visible was because of inversion, the steam/smoke was going down the mountain. It was most certainly doing that in the very early morning as I was watching it billow out and then slide down the mountainside to form a sort of smog just over half-way up the mountain. I cannot say anything about later in the day but if the weather was suitable that inversion could have carried on for a considerable time. I am very concerned that this isn’t ‘game over’ for this volcano. Indonesian volcanos are notoriously unpredictable. Yes I saw a little of that too, but I didn’t have much time to look. It was later on in their afternoon, UK morning that I was typically seeing the taller and more forceful plumes. To be honest, I have no clue as to where this is heading. Yon mountain is giving out mixed messages ! Just read that the authorities in Bali have decided to keep the danger level at 4 for which I am thankful, however hard it is for those poor people to be displaced it would be far worse if they let them go back while things are just so uncertain and it decided to erupt then. Thanks, I thought it was over since the morning before it was steaming real good. Are you sure on that? I can’t really tell the difference, given the light and shade. I was fairly certain I saw a very small ash plume , possibly associated with a small explosion within the crate about 3 days ago as I reported, but nobody else seemed to see it. I noticed a dirty looking low lying haze a couple of hours ago, and again I wondered if there was ash in the air. The ash on the left, or whatever it is, has been there for several days. I took a screen shot of it on the 20th, not sure how long it’s been there for unfortunately. Here’s what I took for comparison.